Michael Dunn and George Zimmerman, 2 Murderers, Not Found Guilty of Murder! Michael Dunn, 47, has been found guilty of 3 counts of attempted second degree murder and one count of hurling a deadly missile. A mistrial was declared on the first-degree murder charge in the shooting death of 17-year old Jordan Davis. 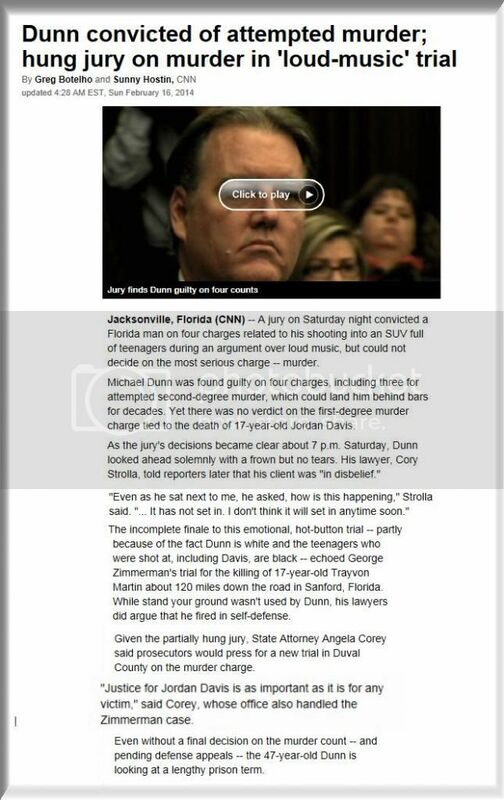 In essence, Dunn was found guilty of everything but murdering Jordan Davis. 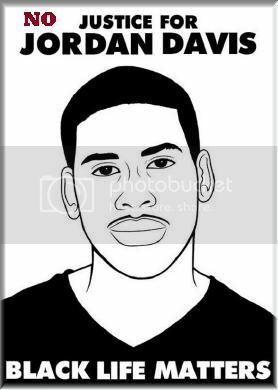 As previously reported by NewsOne, Dunn, 47, gunned down Davis at a gas station in Jacksonville, Florida on November 23rd, 2012. Dunn claims that he felt threatened by the teen  who was sitting inside of an SUV with friends  and loud music coming from the vehicle, so he sprayed the vehicle with nine bullets before driving away, leaving Davis to die in a friends arms. On March 22, 2012, Florida governor Rick Scott appointed Angela Corey as Special Prosecutor to investigate the killing of Trayvon Martin by George Zimmerman. On the evening of February 26, 2012 in Sanford, Florida, George Zimmerman, a 28 year-old neighborhood watch volunteer armed with a 9mm Kel-Tec pistol, shot to death Trayvon Martin, an unarmed 17 year-old, in a gated community. A few hours after the killing, the Sanford Police Department determined that there was no "probable cause" to arrest George Zimmerman, who claimed that he acted in self-defense. Martin was returning to the home of his father's fiancee after purchasing a can of iced tea and a bag of Skittles candy at a local convenience store. Zimmerman told police that Martin was the aggressor and photos of Zimmerman the night of the incident show him with a bloodied, broken nose and other injuries. The decision by Sanford Police Chief Bill Lee and Seminole County State Attorney Norm Wolfinger not to arrest and charge Zimmerman with a crime triggered outrage fueled by social media including a petition on Change.org calling for his prosecution which garnered over 2.2 million signatures, the largest in Change.org's history. Following growing protests, including some 30,000 people in Sanford, Florida alone, as well as media coverage and engagement of the FBI, both police chief Bill Lee and state attorney Norm Wolfinger resigned from the investigation and state attorney Angela Corey took over. 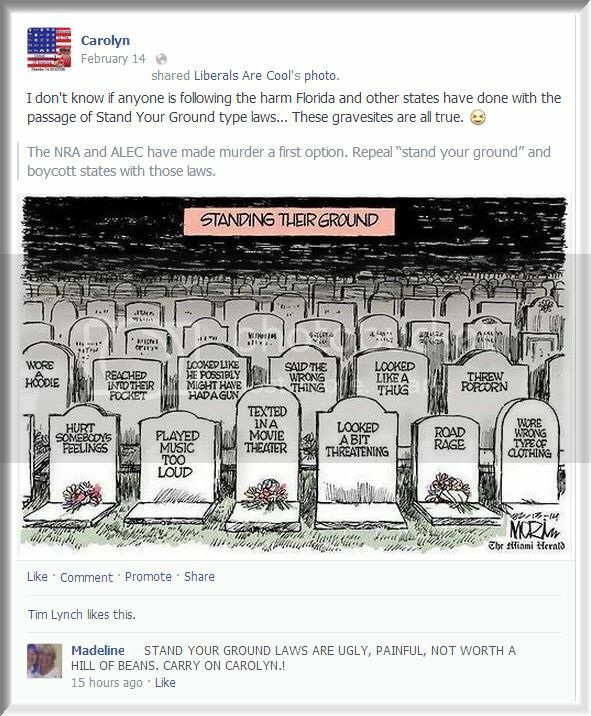 The case has fueled a national debate over racial profiling, gun control, institutional racism in law enforcement agencies, and the role of ALEC (American Legislative Exchange Council) in pushing for pro-gun laws like Florida's "Stand Your Ground" bill.